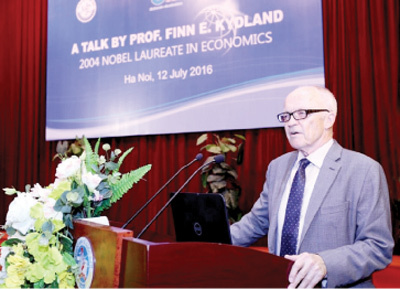 (VEN) - Nobel Prize and Fields Medal winning professors and notable scientists participated in the “Meet Vietnam 2016” Program, an event to promote Vietnamese sciences to the world. The program was held in Binh Dinh and Hanoi with various activities from July 7 – 12, 2016, organized by Ministry of Science and Technology and the Meet Vietnam Association. . The event welcomed six Nobel Prize winners (Professor David Gross (Nobel Prize in Physics in 2004), Professor Carlo Rubbia (Nobel Prize in Physics in 1984), Professor Jerome Fiedman (Nobel Prize in Physics in 1990), Professor Kurt Wuthrich (Nobel Prize in Chemistry in 2002), professor Finn E. Kydland (Nobel Prize in Economics in 2004) and professor Jean Jouzel (Nobel Prize in Peace in 2007) and one Fields Medalist Professor Ngo Bao Chau (2010). Well-known Vietnamese scientists, including Professor Trinh Xuan Thuan, Professor Tran Thanh Van, Professor Le Kim Ngoc and Professor Nguyen Van Hieu also took part in this event. Professor Tran Thanh Van, founder of the Meet Vietnam, said the goal of the scientific workshops in the program is to provide international and domestic scientists opportunities to meet and exchange the latest research results as well as the development of international sciences. The Fundamental Science and Society workshop, for example, is a key workshop in the Meet Vietnam 2016, was held to create an opportunity for scientists to meet with policy makers and representatives of the private sector, talking about the importance of science to the development of society, especially basic sciences.. “We organized 12 international scientific workshops that attracted more than 1,600 international scientists to Vietnam. These are good opportunities for promoting bilateral and multilateral scientific cooperation,” Van said. The program also provided thematic courses for students, scientific presentations, direct and online meetings between Nobel Prize-winning professors and students. Professor Ngo Bao Chau (Fields, 2010) stressed on the fact that more Vietnamese families are sending their children overseas to study. Vietnamese students in the US and the EU are excellent in academic results, some of them are successful in researches or being lecturers at universities. Overseas Vietnamese young talents are huge and the government should have a flexible policy to attract and keep them coming back. 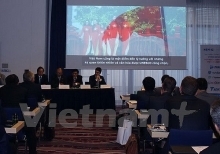 According to Academician Nguyen Van Hieu, former President of the Vietnam Academy of Science and Technology, the international scientific workshops such as the Fundamental Science and Society workshop in Vietnam offers good opportunities for Vietnamese scientists to meet international scientists in person.